Lest you think I have abandoned this blog, I assure you, I have not! Unfortunately, I have not yet figured out how to make time for both blogging and an almost-full-time job. Just when I had a few posts in mind, and photos to go with them, some nagging back and neck pain exploded into constant agony from a pinched nerve (on Easter Sunday, no less), and within a few days, my right arm was fairly useless. A couple visits to the doctor and an MRI later, I was diagnosed with two ruptured discs in my neck and scheduled for surgery. Now I’m two weeks post-surgery, and feeling much better. The pain from the the pinched nerve is gone, and I’d say my arm is about 50% better (some physical therapy is probably in my future). Recovery from the surgery itself is going well. Though I’m restricted from lifting anything heavier than a gallon of milk and not allowed to drive yet, I think I’ll be back to most of my usual activities very soon. If the rest of the family has to carry the laundry baskets and groceries and run the vacuum for a while longer, so be it. Before all this spine surgery nonsense distracted me, at the end of spring break I finally finished Miss Eight’s nightstand project. She had a wobbly three-legged decorator’s table for a nightstand, which wasn’t big enough for her lamp, alarm clock, books, and the dozens of hair accessories and tubes of lip gloss a girl needs. 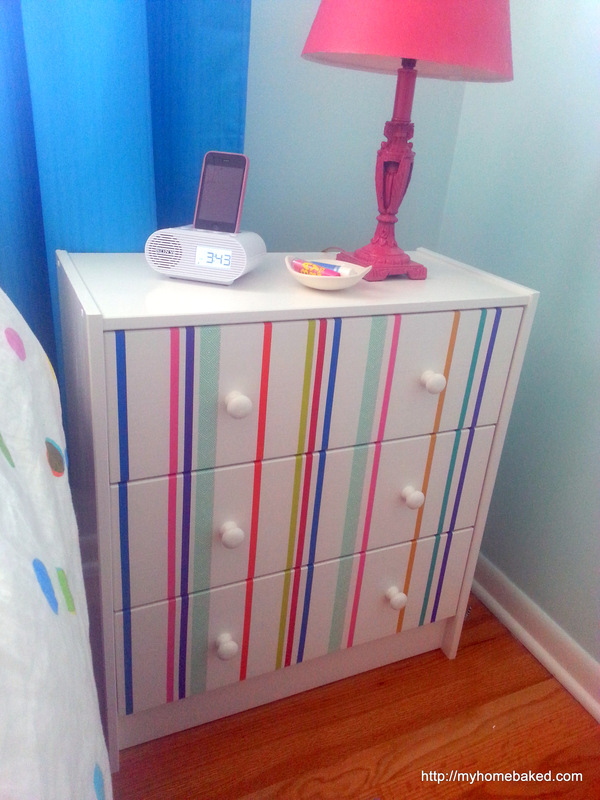 We decided the little Ikea RAST dresser would be the best storage for the money. It gives her a little more surface area on top, plus three drawers to hide the clutter. After wading through a ton of Ikea hack ideas on Pinterest, we decided that a rainbow of stripes on a white background would complement the colorful polka dots on Miss Eight’s bedding. The first coat was bright white semi-gloss paint & primer (the same can that I use on baseboards and trim), applied with a brush. Then I sprayed several thin coats of glossy white spray paint that I bought on clearance when our local hardware store went out of business. 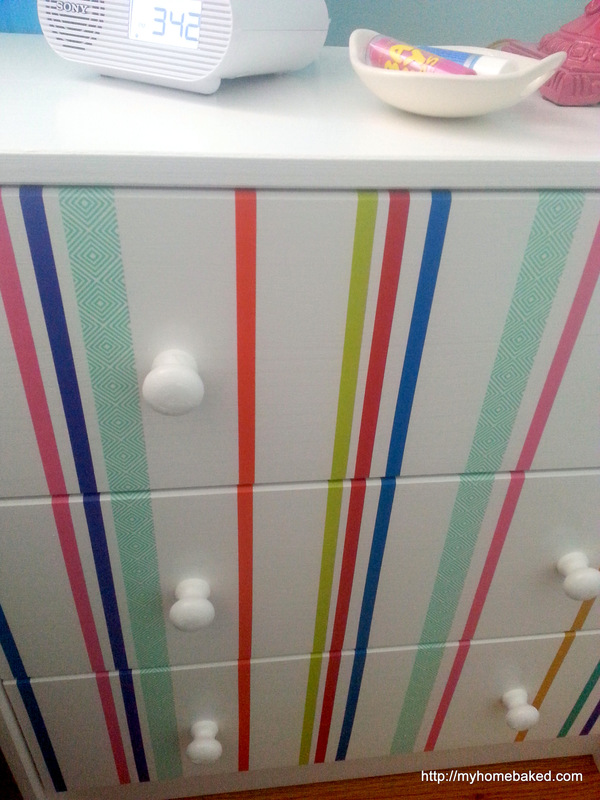 I let the paint dry and cure for a week, and then used a level and a pencil to mark where our randomly spaced washi tape stripes would go on the drawer fronts. The tape was so easy to apply–much faster than paint would have been–and should be easy to remove if we redecorate in the future. Miss Eight picked the colors as we went along, so she was pleased with the final result. Now I have a bag of washi tape left over, and I’m eager to find other uses for it. First up will probably be to hang up all the posters and pictures that keep falling off the walls in Little Six’s room.